Colombo, July 12 (newsin.asia): The Chief Minister of Sri Lanka’s Tamil majority Northern Province, C.V.Wigneswaran, has opted out of the Presidential Task Force on economic development of the Tamil-speaking Northern and Eastern Provinces, saying that the Tamils need a political solution for their long-standing problems before they embark on economic development. In a letter to Sri Lankan President Maithripala Sirisena dated July 9, Wigneswaran said that the Task Force is useless also because it does not include the elected representative of the people or ministers of the Provincial Administration barring the Chief Minister. Putting economic development before a political settlement is like putting the cart before the horse, and so, the development plan will be non-starter, Wigneswaran said. He added that with the government in Colombo being wedded to the ‘top down’ approach to development work, his participation in the Task Force is meaningless. He hoped that by year end, political power will be devolved to the provinces and that he and the President can sit around a table to discuss development as equals. “Apart from me and our Chief Secretary none else represent the Northern Province. Of course the Secretary is a Tamil but a Central Government Official,” Wigneswaran pointed out. The Task Force is asked to direct, co-ordinate and monitor the development activities in the Northern and Eastern Provinces of a balanced socio – economic and income growth. . It is wrong to assume that the development process would forge national unity and integration and that the Tamils could be enticed to accept such developments in exchange for their political and human rights, Wigneswaran said. “I have been time and again informing Your Excellency as well as successive Central Governments that development processes must not be foisted on the North and East by the Centre. The people of the North and East are best suited to choose what they want, to state what their needs are,” he added. “Money is retained by the Centre, projects are chosen by the Centre, implementation is given to officers of the Centre, but our Provincial Officers are asked to do their bidding. And Your Excellency expects peace, tranquility, unity and integration by such one sided activities,” he pointed out. “It is no secret that while you are reviewing the progress so far made in the economic field the Government is actively supporting pre-planned colonization in the North and East to change the ethnic ratio,” Wigneswaran charged. “People’s lands in the Northern Province are being brought under the Forest Department, Wild Life Department, Archeological Department and Other Central Government Departments making sure the Armed Forces and Central Govt Departments control vast acreages of lands belonging to the People of the area,” he complained. “If the Government wants to review development projects there is no need for the Chief Minister and Chief Secretary to be present at such meetings. All the Central Ministers and their Ministry Secretaries and the Military together with the Government Agents would be able to gather the necessary particulars,” Wigneswaran said. “The acceleration of the development underway in the Provinces would refer to processes that are top to bottom exercises undertaken unilaterally by the Centre,” he said. 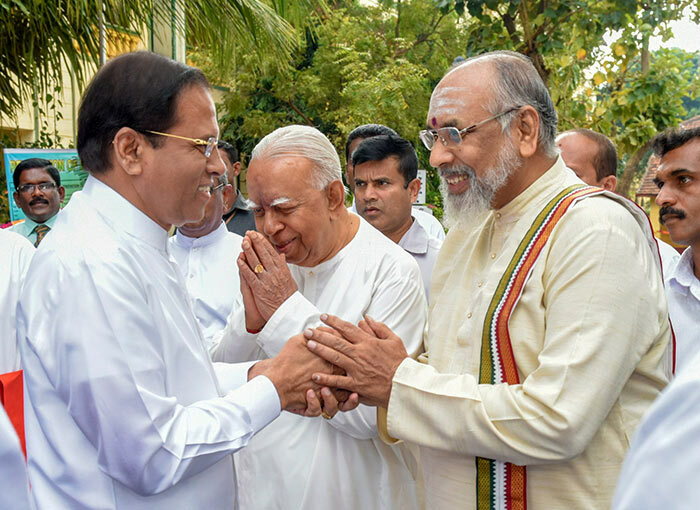 “Hope Your Excellency would pave the way for a political solution soon so that we could sit as equals and develop this country together,” Wgineswaran said.